Argentina’s most prevalent wine-producing region is fast becoming the go-to destination after capital Buenos Aires, with star Malbec luring in visitors. We pick five rather different lodgings across Mendoza. Swiss innovation is fully responsible for this contemporary 11-room hotel that comes with the only hammam in Mendoza. 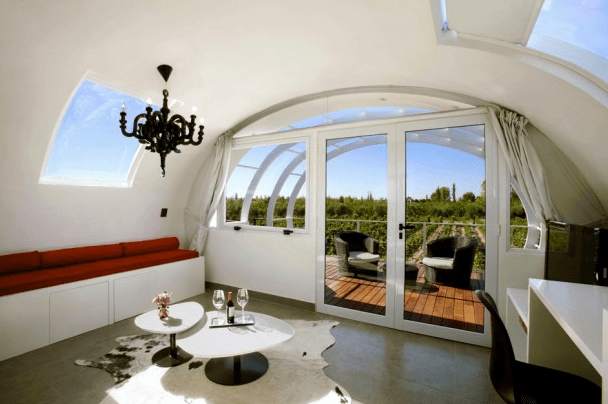 This gorgeous Vistalba-located lodging is both quirky and inspiring: while vine leaf mesh-printed wraps cocoon the four two-storey apartments to give them a natural sense of individuality, the pièce de résistance is “Limited Edition”, a tubular pod on stilts overlooking the vines.